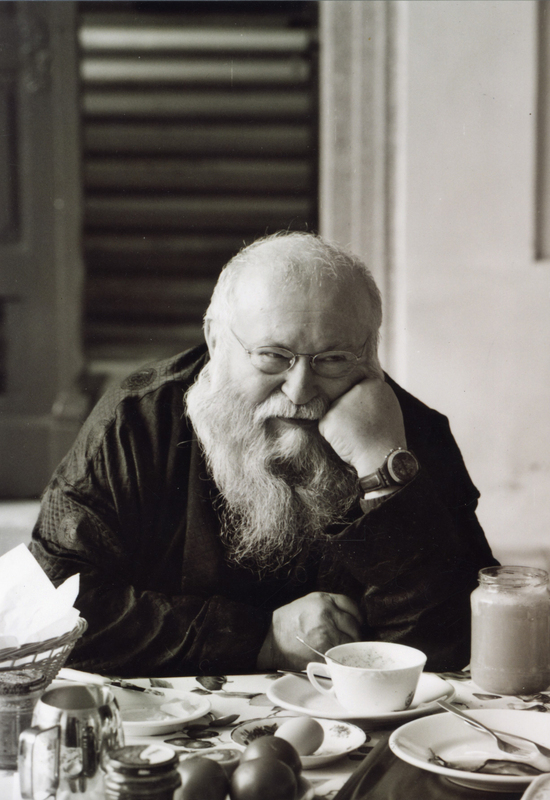 Hermann Nitsch was born on August 29, 1938 in Vienna. He is the crucial founder of Viennese Actionism and is regarded as one of the most versatile contemporary artists: action performer, painter, composer (symphonies, organ concerts), and set designer. His synthesis of the arts, the Theatre of Orgies and Mysteries, encompasses the broad spectrum of his art by calling on all five senses – the tragic leads us to becoming involved with flesh, blood and intestines. Just before completing his training at the Graphische Lehr- und Versuchsanstalt in Vienna with a diploma (1953-1958), Nitsch takes a position as a commercial artist at the city’s technical museum in 1957. Privately Nitsch focuses his artistic interest initially on Expressionism, which he links to mostly religious figurative scenes. Beginning in 1960, following a period in which Nitsch had turned more towards literature, he returned to painting, creating works in the Arte Informel style. It is in this year that the first painting actions take place, and already they are seeking to realize the idea of the Theatre of Orgies and Mysteries. Revolving around the intensive sensory experience of various substances and fluids, these actions become increasingly provocative in the coming years. Following screaming and noise action performances, conceived as abreaction plays, Nitsch undertakes the dismemberment of lambs, which lead to further actions involving flesh. After the Theatre proves a resounding success in the US and Germany at the end of the 1960s, Nitsch performs numerous actions throughout the 1970s in cities across Europe and North America. In 1971 Nitsch is able to acquire Prinzendorf Castle in Lower Austria from the Catholic Church, a purchase that allows him to now also realize his musical ideas for his theatre in large-scale action performances. Noise orchestras, scream choirs and electronically amplified instruments all play a part. Nitsch interprets life as passion, the painting process as a condensed form of life and thus as the very incarnation of passion. Through the painter smock he wears while working, subsequently positioned centrally in the painting, the artist remains present and animates the viewer to identify with the painting process and accompany him into the painting. The highpoints of Hermann Nitsch’s projects are the “three day play” of 1984 in Prinzendorf or the cycle of pour paintings he creates in 1987 at the Vienna Secession. The ideal of the “six day play” is performed in 1998. Since the 1990s Nitsch’s art is increasingly honoured in a series of exhibitions, which are frequently accompanied by performance actions by the artist. In a changed political and social climate, Nitsch can now establish himself as a universally recognized creative artist. Hermann Nitsch lives and works at Prinzendorf Castle on the Zaya River, Lower Austria, as well as in Asolo, Italy. His works are exhibited in the two Nitsch Museums in Mistelbach and Naples as well as in the Nitsch Foundation in Vienna and in prestigious international museums and galleries.